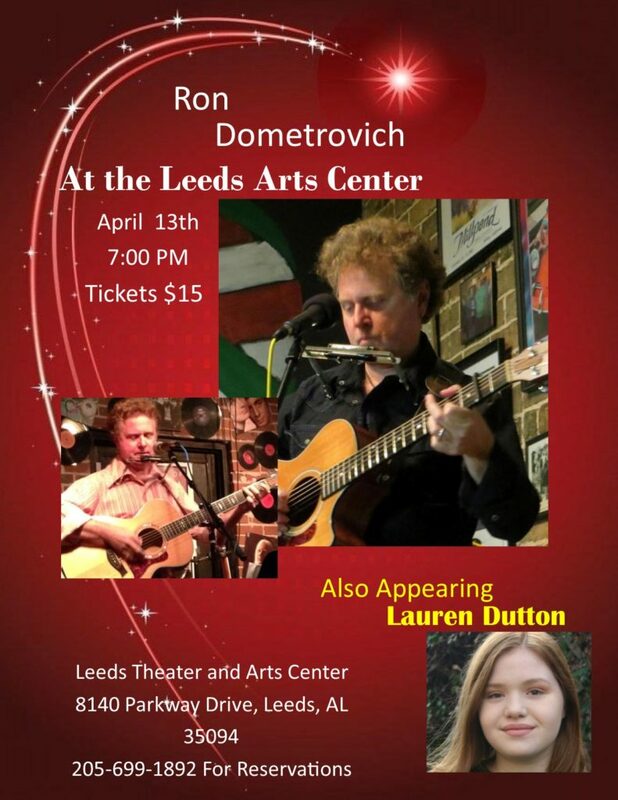 music | Leeds Arts Council, Inc.
All seats are $15; tickets may be reserved by calling the LAC office at (205) 699-1892. You can pay by cash, check, or credit card at the door. ESTHER is a fresh and exciting musical based on the story of an orphaned Jewish girl who becomes Queen of Persia. After Esther discovers that her people are to be annihilated, decreed by her husband the king, she is forced to face difficult and frightening circumstances, with the survival of her entire race seemingly on her shoulders. Told with humor and pathos, the show has generated enthusiasm wherever it has been performed. Everyone loves the music and the characters; come see for yourself! ESTHER is a fresh and exciting musical based on the story of an orphaned Jewish girl who becomes Queen of Persia. After Esther discovers that her people are to be annihilated, decreed by her husband the king, she is forced to face difficult and frightening circumstances, with the survival of her entire race seemingly on her shoulders. Told with humor and pathos, the show has generated enthusiasm wherever it has been performed. Everyone loves the music and the characters. If you’re interested in performing, come out on Friday and Saturday, May 31 or June 1, and audition for the show! Roles available for ages 13 and up. Character descriptions available below. A few non-speaking roles available for children age 6-12. Please prepare 16 bars of a Broadway musical type song. Resume and headshot not required. You will be photographed at the audition. After everyone has sung we will do cold readings from the script. THANK YOU PATRONS of THE LEEDS ARTS COUNCIL! 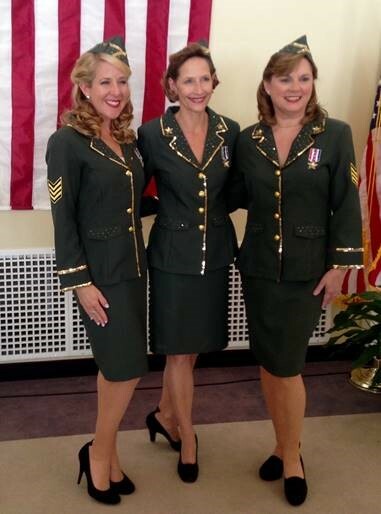 The Dolores Hydock presentation of “Soldiers in Greasepaint,” which was accompanied by The Birmingham Harmony Belles, was a huge success! The audience of over 100 enjoyed an extremely entertaining evening listening to a master orator bring the USO story alive. The Birmingham Harmony Belles added a sense of realism with their beautiful renditions of the Andrew’s Sisters classics hits. A special thanks to all those who contributed to our HVAC fund. We hope to see you again soon at the Leeds Theater & Arts Center – A Fun Place to Be! Come enjoy an evening hearing what some of our up and coming performers are doing. Original music, covers, instrumental talent. 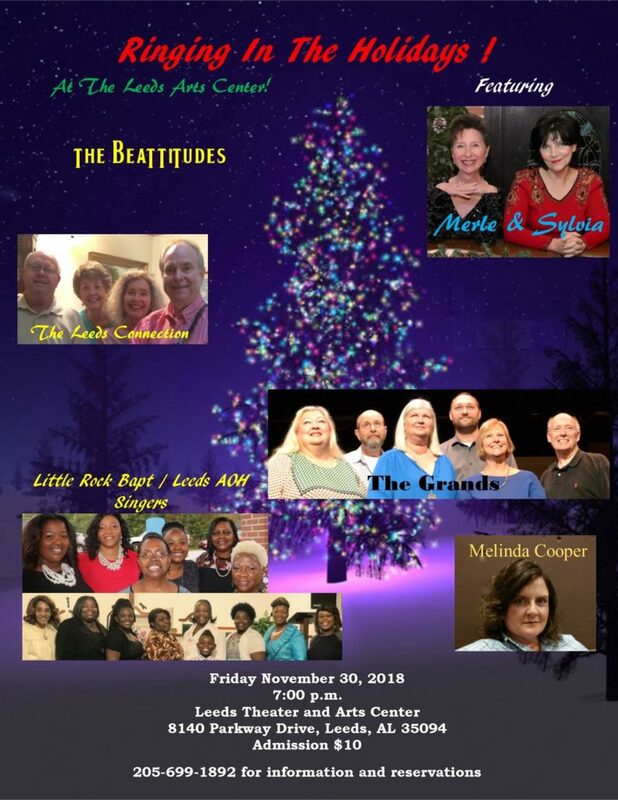 If you’re interested in performing, contact Debbie Landry at (205) 699-0712. Leeds Arts Council presents String Theory on Sunday, November 11, 2018 at 2 pm at the Leeds Theater and Arts Center, downtown Leeds. Tickets are $15. String Theory, formerly known as Blue Galaxy String Project, is an instrumental pop group formed in 2005 that plays an eclectic mix of originals and modern pop songs arranged for string quartet plus acoustic bass and drums. The group is comprised of six conservatory trained musicians representing Northwestern University, University of Cincinnati College Conservatory of Music, Indiana University, University of Alabama and Davidson College. The musicians are united by a common passion to expand their musical repertoire beyond the traditional roles of the string quartet. Musicians are Caroline Nordlund and Pei-Ju Wu violins; Melanie Rodgers, viola; Sam Nordlund, cello; Abe Becker, bass; Michael Glaser, drums. Arrangements of music are from many different sources including band members. The group prides itself on performing music from every genre. Join us on March 17 at 7:00 pm to enjoy the music of the Mac and Moss Combo, including the standard jazz tunes from the “Great American Songbook” such as Blue Moon, Moonglow, All of Me, Moon River, Somewhere Over the Rainbow, and Satin Doll. The Mac and Moss Combo features Nancy McLemore on vocals, Mike Moss on guitar, Jon Ford on bass and Don Wendorf on drums. Tickets are $10.00. For reservations call 205-699-1892 and leave a message after the beep including your name and phone number and the number of tickets you need. Someone will return your call to confirm your reservation. Reservations are not required. Let us know if special seating is required. The audience is invited to sing along, dance, or just sit back, relax, and listen to these favorites. The UAB Jazz Faculty Quintet is made up of some of the finest jazz musicians in Alabama. It includes UAB jazz professors Gary Wheat (saxophone), Michael Glaser (drums), Carlos Pino (guitar), Brandon Peeples (bass), and is led by UAB jazz director Steve Roberts (trumpet). They perform together regularly at UAB and around the region including a monthly concert on every second Thursday at noon at the UAB Hospital’s north pavilion atrium. This fall they will complete their second international tour of the country of Colombia. Dr. Steven Roberts is associate professor of jazz studies and trumpet at the University of Alabama at Birmingham. Previously, he was assistant professor of trumpet and jazz at Mars Hill College after holding a similar position at Iowa State University. He is an active teacher and freelance musician and has performed with Kirk Whalum, Vincent DiMartino, Ryan Anthony, Jon Faddis, Allen Vizzutti, Cecil and Deedee Bridgewater, Chip McNeill, Jim Pugh, Charo and many others. His group “The Roberts Jazz Project” released their album ‘Let’s Fall in Love’ in 2012. This album features Roberts on both trumpet and keyboard. 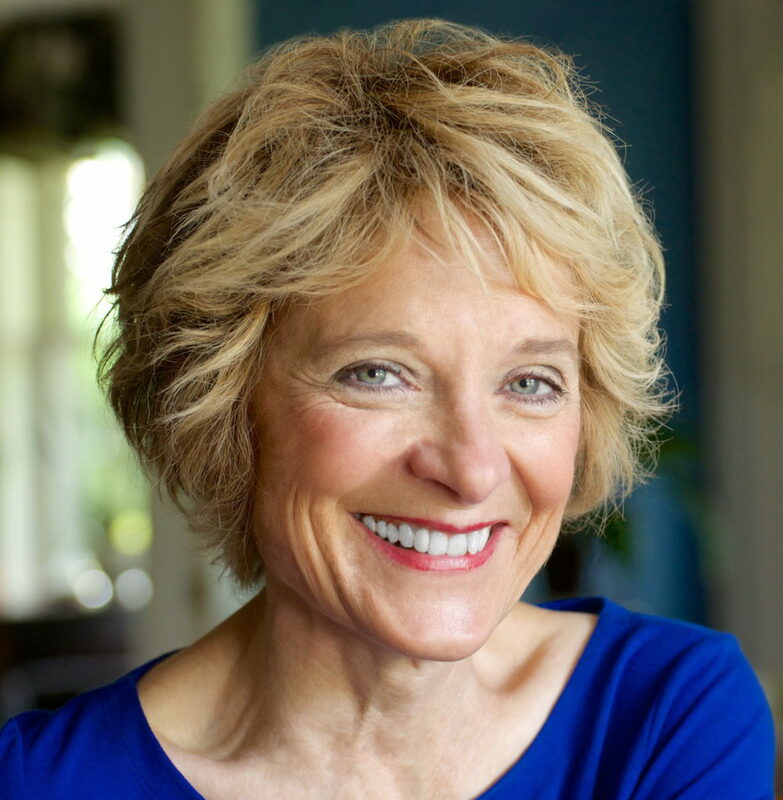 He is music director for Unity Church of Birmingham and Saint Junia United Methodist. As director of the UAB Jazz Ensemble, Roberts has led the group to first place in the Alabama Jazz Hall of Fame competition three out of the last four years. Roberts has premiered arrangements for trumpet ensemble at two International Trumpet Guild conferences, and in October 2012 premiered an original brass quintet arrangement on an Eastern European quintet tour. In the summer of 2014, Roberts toured Europe for a month, splitting time with the UAB Faculty Brass Quintet, the rock band “Downright”, and completing the tour with his group “The Roberts Jazz Project.” UAB Jazz returned to Europe under Roberts’ direction in July of 2016 with a mini big band and performed for thousands in Austria, Italy, and Germany. Carlos Pino, a Jazz guitarist and composer from Birmingham Alabama, is a graduate from the University of Alabama (B.A.) and Rutgers University (M.M. in Jazz Studies). While in college, Carlos studied guitar under Brian Lutterbie, Tom Wolfe, then Vic Juris. Carlos also studied briefly with Jack Wilkins, Paul Bollenbach, and Ralph Bowen. He has shared the stage with artists such as Ellis Marsalis, Claudio Roditi, Oteil Burbridge, Col. Bruce Hampton, and Bill Kruetzmann. Pino has performed all over the U.S., Japan, and Colombia. Over the last 15 years Pino led various jazz and fusion groups and is a sideman in several groups, ranging from big band jazz, spoken word improv, to rock and bluegrass. He has released two albums under his name. Pino has also performed on various radio shows such as “Wait, Wait, Don’t Tell Me” and “The Rick and Bubba Show”. Pino is in demand as a guitarist because of his versatility in various musical styles. He was recently awarded honors at the Festival Bandola in 2016 in Sevilla, Colombia, for his contributions to the festival as an artist, and for his work to bring American musicians to perform at the festival and throughout Colombia. Carlos has been invited as a guest artist to the Confajazz festival in Manizales Colombia in September 2017, as a performer and Clinician. Brandon Peeples has been playing music since the age of 9. Starting out on Alto Saxophone, his talents developed quickly, and after only two years on the instrument, Brandon was selected to play with the Denver Youth Wind Symphony while living in Colorado. At the age of 13 Brandon began playing bass here in Birmingham. By 16 he was playing professionally in local clubs. Upon graduating from high school, Brandon received a music scholarship to UAB, but soon was getting calls to go on national and international tours with various groups. From 2002-2006 Brandon toured the U.S., Europe, and the Caribbean extensively, and recorded several albums with the swing band Band the Buzz. In 2006 he settled back to Birmingham where he has toured regionally with Frankie Velvet and The Mighty Veltones as well as several different local bands. Starting in 2010 Brandon has toured nationally with American Idol Season 5 winner Taylor Hicks. Brandon has performed with Willie Nelson, John Fogarty, The Little River Band, Silverchair, Derek St. Holmes, Jeff Carlisi of .38 Special, Yonrico Scott, Tommy Talton from the Greg Allman Band and Cowboy, Georgia Music Hall of Fame member Jimmy Hall of Wet Willie, Rolling Stones keyboardist Chuck Leavell, and many other local and regional legends. While not on the road, Brandon can be found recording in Birmingham at Sound of Birmingham Studios, Boutwell Studios, and Gintown Studios, as well as playing live five nights a week. He is currently endorsed with Euphonic Audio Amps, Lakland Basses, and Thomastik-Infeld Strings. He teaches as an adjunct instructor for the UAB Department of Music in Applied Bass. Gary Wheat has been performing and teaching professionally in Birmingham for 15 years. After studying with Dr. Jonathan Noffsinger at the University of Alabama and earning his Jazz Studies Bachelor’s degree, Mr. Wheat moved to Birmingham to play with his first band, Meteorite, and to travel across the country to play with national touring musical acts such as the Temptations, the Four Tops, the O’Jays, Percy Sledge, and Frankie Valli. At home, he has logged countless hours at gigs and jam sessions with local jazz names like Cleve Eaton, Bo Berry, Chad Fisher, and Tommy Stewart. Mr. Wheat has taught saxophone and jazz in private and class settings since August 2000, building relationships with band directors at most Birmingham metro area public middle and high schools. He also has years of college-level teaching experience at the University of Alabama at Birmingham. He released his first album, comprised of original modern jazz pieces, in the summer of 2016. It is entitled Star Child and is available for purchase on iTunes, Amazon music, and other online retailers. Michael Glaser is the first call drummer for many of the finest sounds in Birmingham: String Theory, Chad Fisher, The Birmingham Seven, Choko Aiken, The Magic Shtetl Klezmer Band, The Jason Bailey Band, Matthew DeVine’s Big Greasy Brass Band, and Rob Alley’s Alabama Songbook. He covers lots of styles with these groups: original modern jazz, ‘30s-‘40s swing, Afrobeat & funk, classic rock and pop arranged for a string quartet, Jewish folk music, New Orleans sounds, drums for African dance, and more. He is also a bandleader, transcribing, arranging, and performing the music of his favorite jazz composers and performers. He has played in major music festivals in New York City and Lucerne, Switzerland, and did a six-city tour of Colombia with a UAB Jazz faculty group in November 2014. He has worked as a sideman with nationally and internationally-known artists like John P. Strohm (Blake Babies, Lemonheads), Johnny O’Neal (Art Blakey’s Jazz Messengers, Ray Brown, Lionel Hampton), Ron McCurdy (The Langston Hughes Project), musician & spoken word artist Malcolm-Jamal Warner, and Guinean dance master Youssouf Koumbassa.